A miracle one-pan lamb recipe that’s as easy as popping a pan in the oven. Rosemary, garlic, white wine and seasonal veg make this a show stopping family meal. Take the lamb out of the fridge 1 hr before cooking it and use a sharp knife to make small incisions all over the meat. Mix the oil with the oregano, chopped rosemary and lemon zest. Rub the marinade all over the lamb, massaging it well into the cuts. Heat oven to 200C/180C fan/gas 6. Put the garlic, chilli, potatoes, fennel and remaining rosemary into a large roasting tin, pour over some olive oil and toss together. Season the lamb generously, then lay it on top of the veg. Roast for 45 mins until the lamb is starting to brown, then pour in the wine and stock. Continue cooking for 30 mins for rare (55C on a cooking thermometer), 35-40 mins for medium rare (60C) or 45 mins for cooked through (70C). Remove the lamb and rest for up to 30 mins. 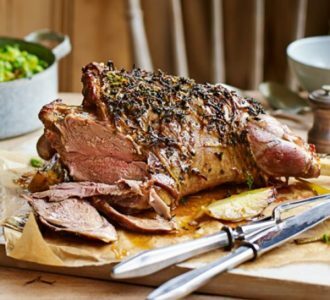 Turn oven down to 160C/140C fan/gas 3, cover the veg with foil and, while the lamb rests, put back in the oven until braised in the roasting juices. Scatter the fennel fronds over the veg, place the lamb back on top and bring the whole tin to the table to serve.